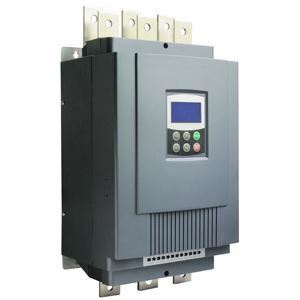 25 hp AC motor soft starter, 18 kW three phase 230v, 415v, 480v, 660v motor starter. Model GS2-018 (230v), GS3-018 (415v), GS4-018 (480v), GS6-018 (660v). A motor soft starter only allows a part of each wave of the available power through to the induction motor, creating an effect similar to a lower voltage start, and increasing that voltage gradually, until the motor has reached normal speed. In other words, the motor is still supplied power at the same frequency at the supply network. This is a much simpler device than a variable frequency drive. A variable frequency drive, on the other hand supplies a (synthesized) lower frequency to the motor during the start. It attempts to maintain a reasonably constant ratio between this frequency, and the effective voltage supplied to the induction motor. In terms of the effect on the motor this means that with a soft starter, the rotor must be able to handle the same energy during start as it would during a DOL or a Y/D start, but the effect of the supply network is gentler with the soft starter than with DOL or Y/D start. With a variable frequency drive, the rotor of the induction motor will only have to handle the slip-energy during the start, this energy may only be a fraction of what would be required with the soft starter, while the effects on the supply grid is very similar to that for the soft starter.